Manuel, I am here. I can see you. Can you hear me? Can you see me? I am flying around your face. Suddenly, Manuel lifts his head. His eyes search the room. Who is talking to him? -Yes, you did hear something. Can you see me? -But who are you and what are you doing here? Asks Manuel. -I am your fairy. Have you already heard about fairies? You know, we have a magic wand and we can grant wishes. We were created to help people like you make their greatest wish come true, explains Isa. Manuel can’t believe his eyes. -Yes. And I saw you all alone and I came to bring you what you want most! Explains Isa. -With my magic wand, I can grant your wish to sing, suggests Isa. -I have always wanted to sing but I need to train at a music conservatory and there isn’t one in my town. -Do what I tell you. Go into town. You will see a group of folkloric musicians. Listen to them and after sing your favourite song with your most beautiful voice. We will be there with you and you’ll see what happens, says Isa the little fairy to Manuel. Manuel goes to the town square. As he advances, he hears a beautiful melody. There are four musicians including a singer. The crowd is enchanted. Emotions emerge from this group and Manuel is full of admiration. -What a voice! What music! Can you hear little fairy? I love the music but how do I know if that is my dream? I also like to play football and go on the computer. So, how can I be sure? But surprise! At the end of the show, Manuel begins to sing. And with the support of the little fairies, Manuel finds the courage to continue. The musicians listen with goodwill and the violinist accompanies him, then the guitarist followed by the accordionist. Encouraged by this improvised orchestra, Manuel now sings with all his heart. The spectators are just as happy to see so much cheerfulness and smiles on faces. Manuel is full of happiness. Thanks to his Fairy Isa, his life has turned upside down for the better. His childhood dream has come true through one stroke of a magic wand – not three wands. Isa leaves joyfully as well. Manuel is happy now. She didn’t return to the humans for nothing. Indeed, the little children see and hear the fairies! Activity: A fairy’s cone hat. Get a piece of coloured paper measuring 40x40cm. Trace a triangle and a curved shape. Cut it. Cut several stars of different size, paint and glue them except for the blue one. Form a cone shape and glue. 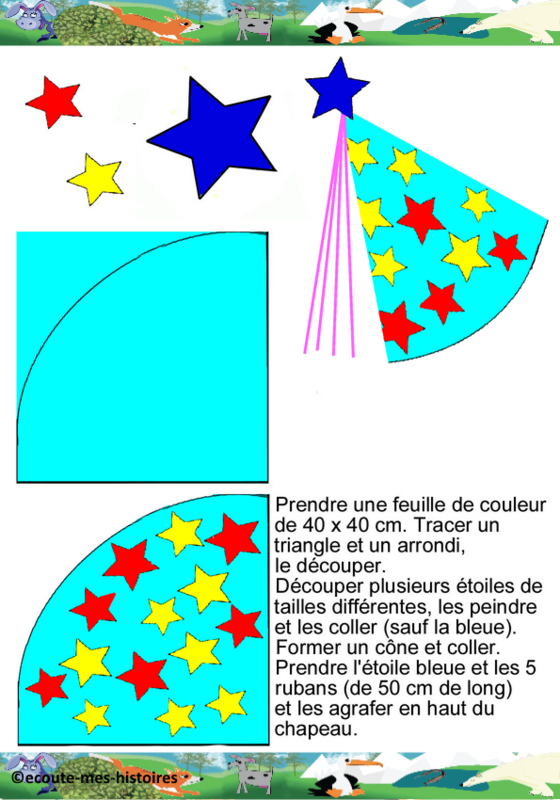 Take the blue star and five ribbons each 50 cm long and staple them to the top of the hat.